Swimming is all about repetition. Decide on a swim stroke that you like and get good at it. Master that stroke before trying to learn all the rest. The Freestyle (front crawl) is the fastest swimming style and the one many people learn first. It’s the most efficient swimming stroke. 1. Some part of the body should always remain above the water. Being fully submerged will be counter-productive. 2. 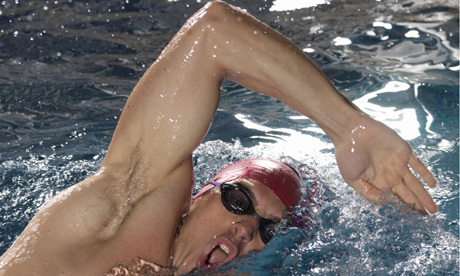 The swimmer should lay face down in the water; reaching out with the left arm in front, grabbing and pulling water down; then reaching out with the right arm and pulling. 3. Your eyes should be looking forward and down. Yes you need to occasionally look forward to make sure you don’t run into anything, but look forward under water. Don’t look UP and forward. Your body will be misaligned. 4. Rotate your body to the side and breathe. Many people make the mistake of rotating only their head to breath but you want to turn your whole body back and forth for the best performance. Rotate the body as a unit, though, in one movement. 5. Kick your legs continuously. A strong steady kick is much more effective than quick thrashing (again MINIMAL splashing!). 6. The shoulders should be at the water surface and roll with the arm action. Hips also roll with the stroke technique, close to the water surface. 7.When pulling hands down into the water, do not cross your arms in an “S” formation in front of your body. The hand and arm should stay in alignment and pull the stroke straight down, brushing your fingers against the side of your thighs. 8. The legs should remain in line with the body. 9. The legs should kick in a scissor kick motion. Don’t bend from the knee. 10. 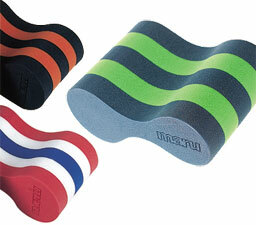 If you’re having trouble putting it all together, use a Buoy between your legs to focus JUST on the arms. 11. Repeat the swim steps over and over to gain proficiency and stamina. During Freestyle, the best way to breathe is when the head turns sideways. Breathing is done while one of the hand is recovering from the stroke. Inhalation is done through the nose as well as the mouth. The air should be exhaled while facing downwards (under water). Breathing can be bilateral (on both sides) or unilateral (only one side) depending on the stroke cycle and distance. I prefer unilateral breathing. It’s the most comfortable and natural for me. There are two types of breathing. The slow, trickle of air being released while you’re under water or the explosive exhale above water. I do both. The bottom line is, as long as your form is correct…how you choose to breath, whether or not you breath on both sides or one, is really about comfort. QUESTION: What is your favorite swimming stroke? How long did it take you to master it? I like freestyle and back stroke. I love that with backstroke breathing is a bit easier, but its harder to go straight! I struggle with backstroke. It’s not my strongest. I recently started going to the gym with my aunt and decided to try swimming with your tips in mind yesterday! I actually go to MSCC — I think that’s where you go (how weird is that?). Anyways, I really really appreciate the tips. I am by no means a swimmer and the whole time I swam I thought of you and your success and the tips you’ve shared so far! I’m having a hard time of it, I was only able to swim for 10-20 minutes, but took that as an achievement (thanks, again, to you!). My form is terrible and I feel like I’m wobbling all over the place. I am completely out of breath by the time I reach the end of the pool, but I’m resting in between laps and working hard. The next step for me is to buy a swim cap, goggles and ear plugs (maybe even a nose plug?). I’m really bad about breathing and I’ve never quite gotten that part down — I’m thinking the nose plug/goggles will help (especially since I’m freaked out by the idea of my head going under water). Thanks again for your inspiration, you are awesome. Kassi-that’s so great that you’re trying swimming! And yes, I used to go to MSCC. That’s where I swam to lose my weight. I also wear a noseplug (habit from synchronized swimming) and it’s much nicer.